I was sitting in my room with my friends listening to my Ipod on shuffle. All of a sudden Tupac Shakur’s “Hail Mary” comes on the speakers. He opens “Makavelli in this? Killuminati/ All through your body/ it blows like a 12 gage shotty [shot gun]”. For years I have been a fan of Tupac and I knew that he called himself Makavelli during the later years of his life. I was also aware that this was a play off of the philosopher Machiavelli. Prior to Political Theory 101 I had never read any of Machiavelli’s works but knew that he was important in the political science arena. I attributed Shakur’s alias to the fact that while he was mostly associated with the “Thug Life”, he was also politically conscious. As I thought about it, that is not a good enough answer for me. 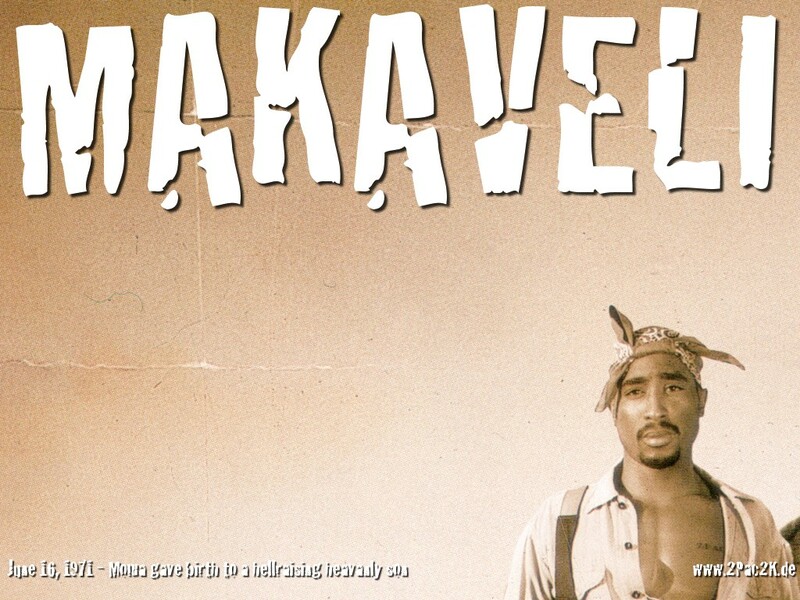 So I did a little research on why Tupac called himself Makavelli. 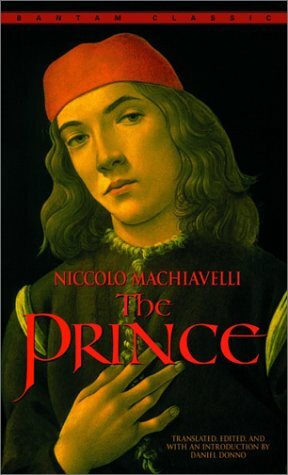 I found out that while imprisoned in 1995, Tupac actually read Machiavelli’s “The Prince”. So what I have decided to do is to go back and read my notes on “The Prince” and compare it to Shakur’s lyrics on albums released during and after his imprisonment. I believe that the two will correlate more than I previously believed. he was released from prison. One of the purposes of the book was to give advice to new tyrants and others who wanted to gain and maintain power. One of the things that he discusses is skill and luck or virtú. He mentions in chapter six that “ a prudent man will always try to follow in the footsteps of great men and imitate those who have been truly outstanding, so that if he is not skillful as they, at least some of their ability may rub off on him”. I can only imagine Tupac reading those words and thinking that while he is a skilled rapper, he wants to be able to maintain power and get better. He may have read on with the intent of following the words of Machiavelli. Prior to being in prison, Tupac had a successful career. He had 2 albums that reached gold status and one that reached platinum. He had however been shot 5 times in 1994 and was having legal troubles. These issues could have had a devastating impact on his popularity if he did not come back from prison in the right way. Chapter Fifteen: “About those factors that cause men, and especially rulers, to be praise or censured”, is where I believe Machiavelli reached Tupac. He writes “ my hope is to write a book that will be useful, at least to those who read it intelligently, and so I thought it sensible to go straight to a discussion of how things are in real life and not waste time with a discussion of an imaginary world”. Shakur had rapped about things that many people felt were too raw for music. I have watched interviews were he said why make up stuff to write about when he can write about the injustices and the crime that is going on in the streets. Machiavelli in the same chapter mentions that a person with power can not always be perceived as having good qualities. He says that there are things that are virtuous but will lead to your downfall and things that are bad but will make you prosper. Tupac also rapped about how this quality for instance in “Changes” saying “I ain’t never did a crime I ain’t have to do/ but now I’m back with the facts giving them back to you”, displaying that he has faults but is now committed to educating the masses. 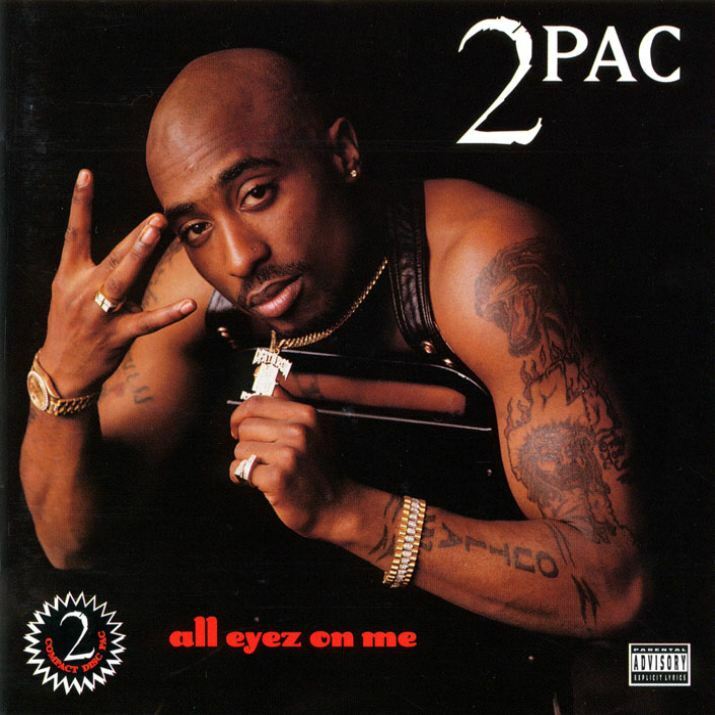 Chapter Seventeen: “About cruelty and compassion; and about whether it is better to be loved than feared, or reverse”, correlates with the albums that Tupac released during (Me Against the World) and after (All Eyes on Me) his imprisonment. Listeners who compare these albums to his earlier works will hear that these lyrics were angrier that his normal gangster tone. He was no longer the fun loving, politically conscious, ladies man. These albums include misogynist lyrics, threats to all his enemies, and even predicting his own death. His song “Hit ‘Em Up” is a prime example of the anger he displayed toward his enemies where the chorus was ”Grab your glocks when you see Tupac/Call the cops when you see Tupac/ You shot me but your punks didn’t finish/Now you bout to feel the wrath of a menace” People were worried that his lyrics would erupt in a East Coast vs West Coast war but his ratings skyrocketed during this period of time. In his case, it was better to be feared. Machiavelli discusses in Chapter Nineteen how to avoid being hated. Tupac’s last album before his death featured songs where he apologizes to woman for disrespecting them and that the black community needs to unite. In Chapter Nineteen Machiavelli also says that if you follow his prior advice you will have the reputation necessary to be protected from people who conspire against you. You have to keep people around you happy so that they won’t turn against you. He writes “As soon as you tell someone who is discontented what your are planning, you give him the means to satisfy his ambitions, because it is obvious he can expect to be richly rewarded if he betrays you. While Tupac’s murder remains unsolved, people believe that his “friend” and owner of his record label Suge Knight had something to do with his murder. Tupac had mentioned leaving Death Row Records and forming his own label called “ Makavelli Records”. In some people’s minds, this was Suge Knight’s motive because if Tupac left the label, he would not receive royalties or be linked to his success. These are all just theories and connections that I have made based on my knowledge of both Tupac and Machiavelli. The correlation between Tupac’s life and lyrics and the teachings in Machiavelli’s “The Prince” has given me a new appreciation for both artists. This is a great post. I love the fact that you point out this connection between Tupac and Machiavelli. I have read about how he read The Prince in jail as well and always found it very interesting that a person who is seen as a “gangster” to the world actually based his lyrics off of a great political thinker. This should give people a better appreciation for rap music. Or at least Tupac’s music. Thank you. There are other rappers who have learned from political theorist and translated those writings into their songs. I would argue that Tupac Shakur will be, if he is not already, considered one of the great philosophers. He may not be a conventional theorist but he was able to provide an urban perspective to politics and things going on in the U.S. I swear we are like twins. I love Tupac with all my passion he is like my life support, you could kinda say.I have also studied about Pucs obsession towards Machiavelli. Machiavelli was a great philosopher and spoke the truth of the world like Tupac. I wish more people could read “The Prince” by Machiavelli , so they can understand why rappers rap such raw lyrics. This was a really thoughtful post. I liked how you interpreted Machiavelli’s thoughts and compared them to Tupac’s lyrics. His lyrics are really poetic. I think it is interesting to compare someone as intellectual as Tupac to some of the rappers today. It seems many rappers have gotten lazy and uncreative with their lyrics. I thought this was a great post, really good job of finding a connection between Machiavelli and a contemporary artist. I find it very interesting that Tupac was such a fan of Machiavelli. As a pretty big Tupac fan i have always said that Tupac’s music is the best lyrical work out there, maybe Eminem but different kind of lyrics. I have always thought that Tupac was a great rapper and thinker in the way that he didn’t rap about what modern day rap seems to be about, girls, booze, smoking, etc., but instead Tupac always seemed to touch upon the issues of today or his life in a unique forum. I find it very interesting that he was so well-versed in Machiavelli/philosophy, and would definetly agree with you that in time he will be considered one of the greatest and most original, due to the presentation and creativity, philisophers. This was a great, dare I even say epic post, as I too am a huge Tupac fan. It is funny because just a few days ago I was reading about how Tupac was “reborn” in jail as Makaveli for his last album, and then you had this great post. Tupac led an interesting life as a rapper, because he transformed himself from a rapper who only rapped about material things (women, booze, drugs), and started rapping about politics of the time. I have always considered him the greatest rap lyricist, and believe that his work should be preserved and studied like Bob Dylan’s songs/poems. It was interesting to see his connection to Machiavelli, such as not wanting to be be hated because he feared for his own death. While writing “The Prince” was the conventional medium for Machiavelli to publish his political thoughts/ideas, it was interesting to see how even music can share political ideologies intent on helping the population. Illuminati. It is crucial to be aware of the world we live in. We can’t continue to let the good ones die in the hands of sinister cowards. Love your post. Couldn’t stop reading. I’m a huge fan of 2pac and recently picked up the prince to read. What makes me keep on reading literature these days is knowing the people who wrote this were siting at home just like us writing and probably thinking about us as they write. what could they contribute to the world. are there any books that write about the connection between Tupac and Machiavelli? tear away all the self-delusions and denials. Can I simply say what a comfort to uncover somebody who truly knows what they are talking about on the internet. Very insightful! I am a student of philosophy and a political junkie and knowing “the prince” quite well, had been very intrigued by Tupac choosing this name. Ive read it was an “alter ego”, but i think, as you seem to, that it was more of a consciously inspired choice that had signifance to him personally and philisophically, and hardly related to a marketing strategy in itself (but perhaps ironically this is also a part of his strategy as redefining himself branded with the name of the famous thinker and strategist) and xcertainly not just some aesthetic used to entertain or sell records, regardless if that helped. I really enjoyed your specific speculations and even if they may not be what went through tupacs mind, they are te best and most interesting ive seen yet!